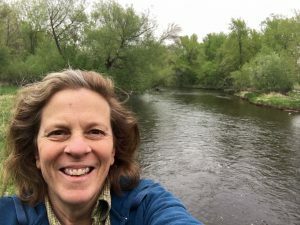 On my commute into the U. recently I listened to a radio conversation with Sharon Day, a member of the Bois Forte Band of Ojibwe, who leads Water Walks along rivers throughout the U.S., including here in her native state of Minnesota. A few years ago she walked the length of the Mississippi River, which took her 64 days. Sharon Day walks with other Native Americans and anyone else interested, and meets up with local people in their communities along the way. Women take turns carrying a copper vessel of water that they gathered from the headwaters and use in healing ceremonies along the length of the river. My Western mind paused in that place before cognizance, and the intuitive part flashed on me on the banks of the Rum River (Dakota name is Watpa wakan), where for twenty years I have walked the half mile stretch on our property. My family and I have also swum and fished in, paddled, floated, and snowshoed on this wild river, which eventually flows into the Mississippi. I consider that time as meditative and restorative for me. Sharon’s response has me considering the possibility that when we give our focused attention, in love and wonder, could this also be efficacious to the water? Soon Acharn Cathy and I and you twenty students will be walking along the banks of the Mekong River (Mae Nam Khong, Thai-Lao for “mother river” or “mother of water”). While discovering its wonders we will also be learning about the impacts of globalization and climate changes on ecosystems as well as the communities and their cultural traditions and ways of living. We will do service learning with the Love Mekong group, who are building a school on the banks on donated land. 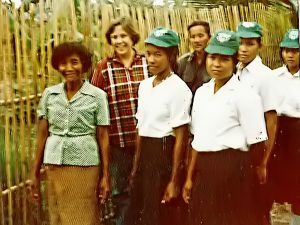 The school helps villagers and visitors learn about local and cultural knowledge of the Mekong and its peoples. Not too long ago, Kru-ti, one of the Love Mekong leaders, and others including Buddhist monks, walked north and south along the river in Thailand, and across to neighboring countries. At night they slept on the ground, and during the day they visited with the villagers and shared knowledge about the reasons for the changes in the river, the impacts, and strategies for resisting and thriving. Many people that Kru-Ti talked with didn’t know why the river was changing, because it wasn’t covered in the local papers; only that they were experiencing a drastic change in their ability to fish, gather vegetation and other food as a source for eating and selling at the market. Walking along a river: this we can do. The challenges of resource conflicts, global warming, and globalization are so complex, one is tempted to look away. But a walk along a river, meditating on the living presence of water, alone or with friends or people with local knowledge, as well as others with different perspectives and/or cultural backgrounds, could help us move beyond “the period of isolation” (Dostoevsky). Our lives have shifted away from rivers and lakes, to roads and highways, and the places they take us. We are removed from the rivers’ ways, as well as how water sustains our lives. It is very hard to have hope for positive change, but something about traveling to Thailand with Acharn Cathy and students, interacting with the Thais and the Hill Tribe members, as well as the amazing country (and food), revives my hope in what could be. Through these blog entries, perhaps others can join us as we journey through Thailand on our learning abroad, and in this way they can walk with us as well. Linda Buturian on the banks of the Rum River (Watpa Wakan is the Dakota name for the river, meaning “Spirit river”).